Comedy Night at The Brew Shed! Mark your Calendar for May 22nd! It will be funny! Hey, Eugene/Springfield humorous folks out there that want to enjoy a great night of laughs with our very own local comedian Alex Elkin Stand-Up Comedian, then come on down May 22nd! 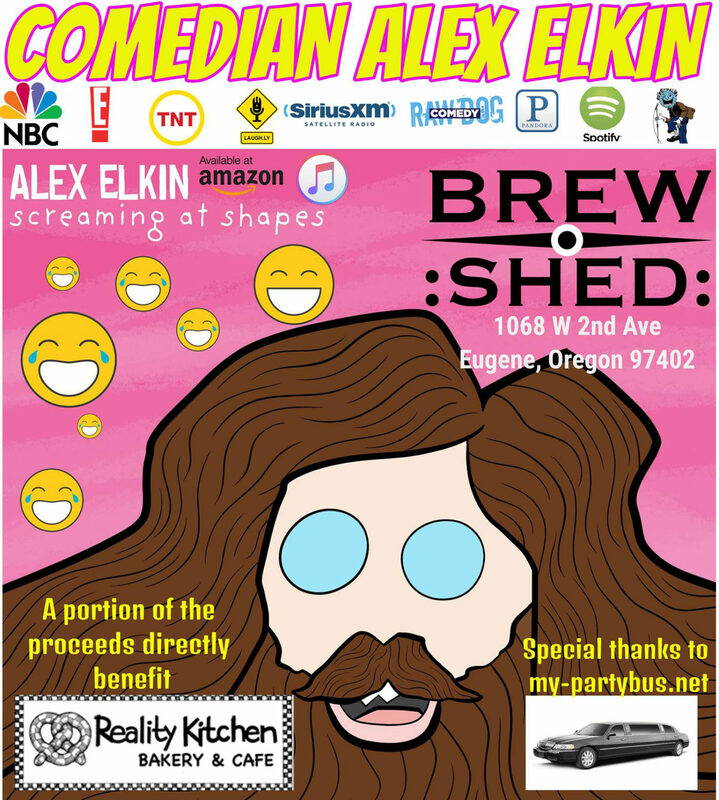 The Brew Shed, My Party Bus and Alex are raising money for Reality Kitchen here in Eugene that not only makes some of the most excellent bread but also helps students with disabilities! From 6-9pm for only $20 per person, enjoy a comedy show that will have you in stitches(figure of speech, hopefully). Alex will be on from 7-8pm and he will have merch to sell after the show. Come early to grab a seat! Thirsty? Let our bartender pour you a drink, so you can sit back and sip on handcrafted cocktails from Heritage Distillery, local Beer from Hop Valley or choose a Cider. All for purchase and this is a 21+ event. Hungry? We will have several different sandwiches and other bread items made from Reality Kitchen bread for sale. Need transportation or don’t want to deal with parking, then catch a ride with My Party Bus and grab all your friends. Proceeds for every shuttle booked to the show will go to Reality Kitchen as well.